Whether you are bargain-hunting in the mall or looking cute but cool at a party, denim is likely to be part of your outfit - in fact, denim clothing is now more popular than ever, so there's an increasing risk of merging anonymously with the crowd. 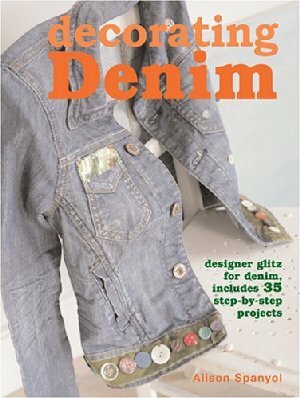 "Decorating Denim" by Alison Spanyol gives you the means to recapture your individuality with customized jeans, jackets, skirts, and more, transforming off-the-rack clothes from plain and boring to all-out gorgeous. Adding patches, applique, and embroidery to ready-made denim is a quick and easy way to acquire couture style at thrift-store prices. Add drama to your favorite pair of jeans with shimmering sequined hearts or introduce a hint of retro chic to a denim jacket with velvet trim and buttons.